My story “The Boxer” appeared in CrimeSpree 41, April/March this year (link goes to Amazon, Kindle edition $2.99 – non-affiliate link). It turns out there was a production error in the printing, with part of the story missing. And so the story appears in full on the CrimeSpree Website. Hope you like it. Funny thing – I had my own little production error with the story. “The Boxer” was a kind of working title, but it quickly got changed to the final title – “Take the Fall” – which makes more sense. Somehow when I submitted it, I put the old title back on, and that’s how it’s stuck. To add to the irony, there’s a boxer (professional?) with my name too, so if you do an internet search for Sean Monaghan The Boxer, you’re going to find that guy way ahead of finding my story. BTW “The Boxer” (“Take the Fall”) is an interlinked story with some others – “While He Lay Crumpled” published in The New Flesh, “Join The Band” published in PowderBurnFlash and “Breathe In published in Flashes In The Dark. Read in any order. The issue of CrimeSpree also includes an interview with Don Winslow. I recently read his book The Dawn Patrol – very different kind of crime-thriller. Interesting guy. 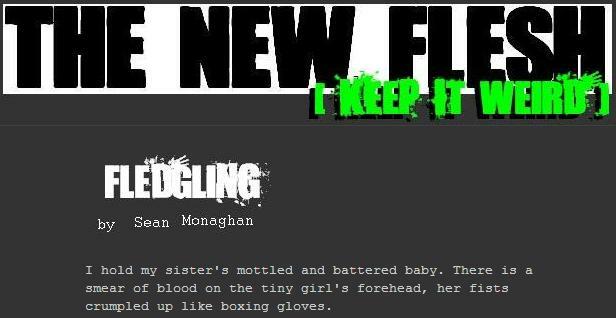 This entry was posted in fiction and tagged crime fiction, crimespree, flash fiction, flashes in the dark, new flesh magazine, powderburnflash on 5 October, 2011 by Sean Monaghan. I’ve published a lot of stories this year, as you can see from my bibliography. They’re all, for one reason or another, personal favourites, though some I might have thought a little less of have proven more engaging for some readers. I’ve tried a variety of styles and genres this year, from hard sci-fi to humourous horror and been published both in print and online. Overall, it’s been a good year, a banner year in fact – I’ve published more this year than all previous years combined – exceeding my own ridiculous goal (lesson: aim high). I still have so much more to work on and a set of new goals that will push me and challenge me – I will publish far fewer pieces, but look for longer stories, and different approaches. 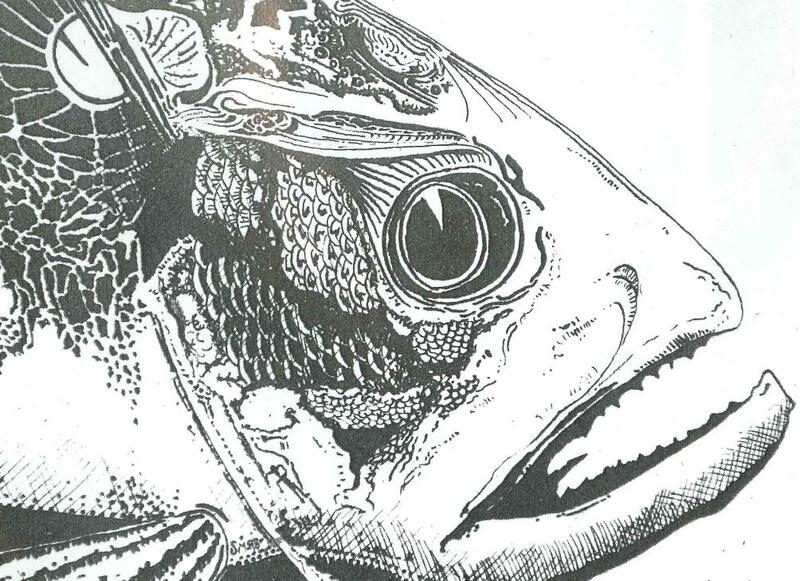 This entry was posted in fiction and tagged 365Tomorrows, bewildering stories, fiction, fish, flash fiction, flashes in the dark, new flesh magazine, online fiction, pulp metal magazine, short fiction on 31 December, 2010 by Sean Monaghan. New Flesh Magazine editors William Pauley III and Brian Barnett (with a nod to Suzie Bradshaw too, I’m sure) have compiled an ebook of their favourite stories from New Flesh’s first year – including some of my pieces. The New Flesh is an online flash fiction publication, filled with misfit, bizarre and weird stories, so this ebook will be pretty unusual. 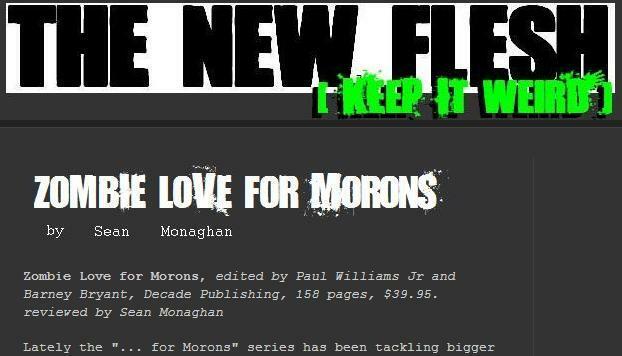 You can download the ebook for free through the New Flesh Magazine website. Happy reading. This entry was posted in fiction and tagged brian barnett, flash fiction, horror fiction, new flesh magazine, suzie bradshaw, william pauley iii on 12 August, 2010 by Sean Monaghan.